The Proforma Invoice Template is a document issued to customers requesting payment for a product or service before the product is delivered, or the service rendered. It is popular in the realm of shipping, as it gives customers a chance to inspect the purchased item before paying for it in full. It can also be used a quote, giving the customer a sense of what a service would cost before being complete. However, because the proforma invoice is not the ‘official’ invoice, unlike the one sent once work is complete, the buyer should understand the proforma invoice is subject to change – as unexpected costs, events, or a longer-than-expected job can all increase the final invoice amount. Download the Proforma Invoice in either Adobe PDF or Microsoft Word. For the ‘Bill-to’ section, enter the Name of the individual or company being billed, their Invoice number, Customer ID (if applicable), Address, and the date that the invoice will be issued. Next, in the first table, enter the Products the client is being charged for. In the PDF version, the amounts will calculate automatically. In the Word version, you will need to calculate each Amount field by hand. Once the first table has completed, repeat the process for any labor services being charged. For the Word version, multiply the Subtotal field by the Sales Tax field, and add the result to the Subtotal amount to find the invoice’s Total Amount. Enter this value into the TOTAL field. For the PDF version, to ensure the Total calculates correctly, enter the Sales Tax in decimal format. At the bottom of the document, enter the Number of Days the client has to pay the invoice in full. Then, in the comments box, enter any Notes or info the seller has for the buyer. This can include a thank-you to the buyer or an address for them to send the invoice payment. The Proforma Invoice is now complete. Start by downloading the Proforma Invoice in Microsoft Excel. Begin by entering the Name of the company directly below the main title. Then, enter the Contact Information of the company, including the company Phone, Website, Email, and Address. In the ‘Products’ table, enter the Number of items being sold, a short Description of each, and the Cost of a single item. The Amount fields will automatically calculate. 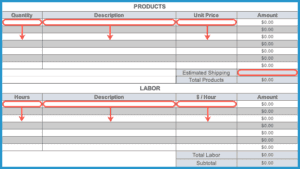 At the bottom of the table, enter the Estimated Cost of Shipping for the client. Below in the ‘Labor’ table, enter the Number of Hours applied to each service as well as the Cost per hour for each service. As above, the field on the far-right will calculate on its own. At the bottom of the Labor Table, enter the state’s sales tax (as a percent) in the Sales Tax field. The TOTAL field will now display the full invoice amount. To the left of the TOTAL cell, enter how many Days the client has to pay the invoice in full. In the ‘Comments or Special Instructions’ box, enter any miscellaneous Info for the client, such as payment instructions or amount corrections. The Proforma Invoice is now complete and can be printed or sent to the client digitally.